Uploading a video to GoodVision is a piece of cake. There are two ways to do that — via browser or via enteprise API. This manual describes the first option. You can upload any standard camera recordings in standard MPEG4 containers. All you need is a video and the internet browser. Just drag’n drop the file to the GoodVision’s video upload screen and you are all set. How do you search for counts or events in your video today? Manually? GoodVision interactive user interface allows user to search for it like magic wand. Anytime user changes the filters described below, application automatically refreshes the view with filtered data right away. Anywhere, anytime, and repeatedly. Graphical filter — user can draw virtual lines and zones directly on the screen and limit the search on events happened within these areas. How many cars are driving the highway? Draw lines at the desired lanes and count them. How many people stopped at your store’s display? Draw a polygon zone and specify criteria to find who holds up in this area and for how long. Graphical filters can be combined into composite filters with Boolean logic, allowing monitoring from place A to place B or counting on multiple places at once. 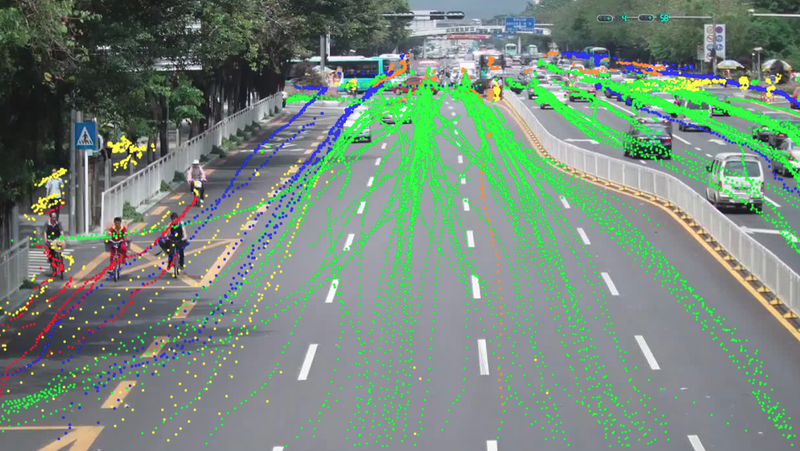 Composite filters allow user to route monitor traffic only in specific directions like turns. Time filters — user can limit the search to the preferred time interval of the video. This feature allows to pick a time interval to narrow the search, visual reports and graph statistics. What about looking at exact traffic routes during peak hours? Attribute filters —search can be limited by object types, colors, and other relevant attributes. How much freight traffic crosses the junction? Select trucks and buses and filter it out. Or are we specifically looking for blue/black, slow-driving trucks? User can choose multiple attributes that are relevant to his search. Analytical filters — user can apply advanced analytics on the data to get more specific information. Sometimes we need to look for objects according to their behavior on the scene. E.g. for cars that stopped. For people who stood or lingered in the same place for specified time. Filter object by time they spend in the area — this new analytical filter allows you to filter out objects which have spent between X and Y seconds in the given virtual zone — i.e. on left turns. All is available from the data. GoodVision’s interactive user interface allows to visualize and breakdown the data as needed. 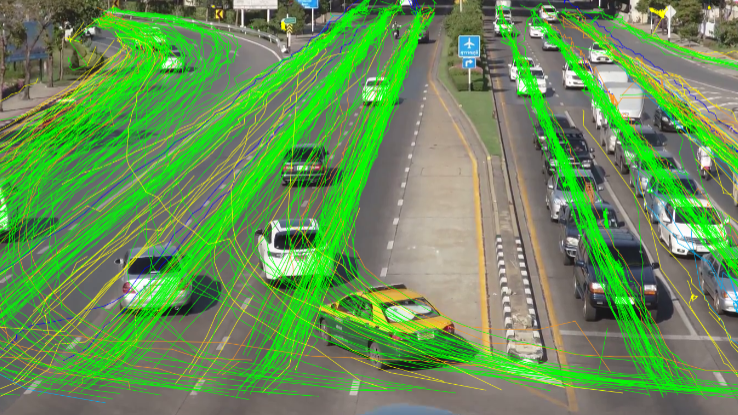 Visual maps display various types of information about object’s behavior hidden in the video data. They are helpful for knowing the individual foot patterns or frequent zones in retail or to find exact traffic patterns and density on the city junctions. Trajectory map — visualizes exact object routes in the video, from entering the scene, to the time they left it. Display exact object positions and density of movement using position maps. Position map — visualizes exact object routes in the video, from entering the scene, to the time they left it. Display exact object positions and density of movement using position maps. Motion frequency heat-map — visualize the frequency of object movement in the video. More traffic, the hotter the area. 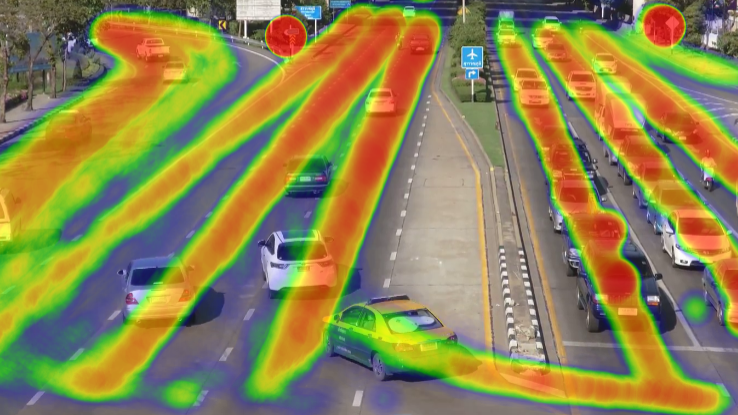 Speed heat-map — visualize the areas where traffic significantly decelerates or accelerates. The more traffic decelerates, the hotter the area. Hold-up heat-map — special type of a visual map dividing the scene into sectors and displaying average stay of objects within each sector for a given time interval. 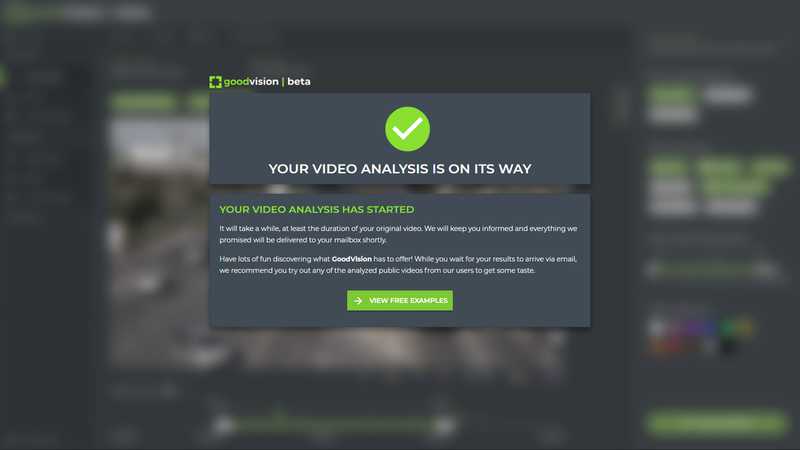 GoodVision Video Insights allows user to review the activity in the video from extracted structured metadata in a form of graphic diagrams. Activity timeline displays the overall course and amount of activity over time. Pie graphs at the top of the Reports screen provide user with a detailed counts and composition of object types in the video according to the applied filters. 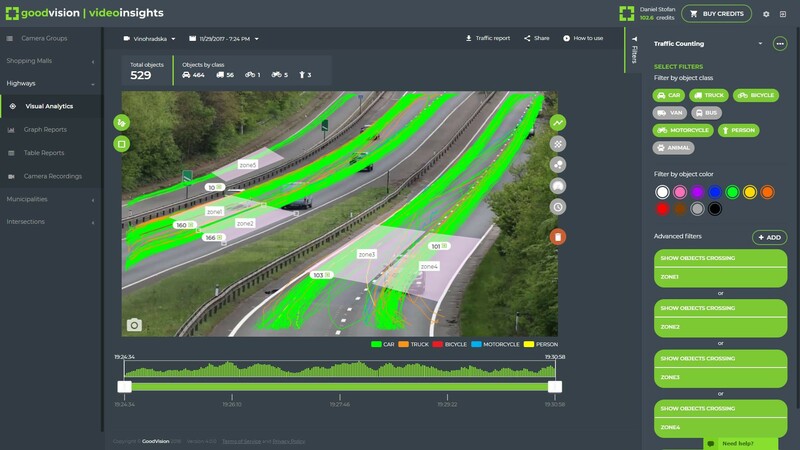 This allows user to count all types of objects or identify hours of peak traffic. Peak of Objects — represents the peak number of objects happened in the video and the exact peak time interval (according to chosen granularity) when the peak happened. Individual sections of the pie graph display the number of particular object type during peak interval. Average Number of Objects — represents the average number of objects per time interval (according to chosen granularity) across the video. Individual sections of the pie graph display the average number of particular object type. There are several available bar/area/heat-map diagrams available to display various aspects of object flow distribution i time by given filters — e.g. traffic in specific direction. These diagrams help user to identify traffic flow time patterns, change of object variety in time, traffic jamming or deaf time spots. Time filter for diagrams allows you to pick a time interval to narrow your statistics and also to adjust your time granularity of results. Granularity is automatically limited to provide you the best readable view of data. What about looking at peak hour statistics in greater detail? GoodVision user interface enables user to display the time distribution of query results in a standard table and can be exported into MS Excel file.